Now that we've covered why pollinators are important, what pollination is, who the major players are, and what their lifestyles are like, we can comfortably move on to the last portion of this blog, in which we'll learn how to turn your home landscape (or a portion of it) into a pollinator-friendly habitat. It is the area in which an organism lives. It consists of both abiotic factors (sunlight, temperature, moisture - physical conditions) and biotic elements (other living organisms - plants, people and predators alike). It follows that, in order for you to create a habitat that can sustain a population of pollinators, you must first take into consideration your site's existing abiotic and biotic attributes. Which spots get the most sun? Are there any damp, shady areas? Is the climate tropical, subtropical or temperate? These items essentially determine which plants you can grow and where to plant them. If you've got plants already, make a list of what you have, noting their height, which month(s) they bloom in (if at all), the color of their flowers, if they are native, and whether they are larval hosts. 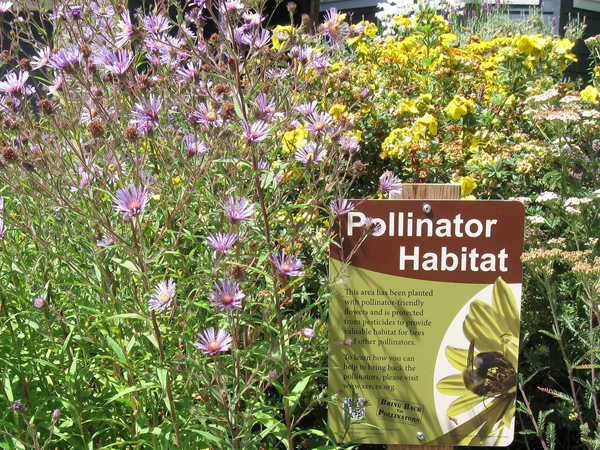 Record this data in spreadsheet form if possible (see the following link for an example: pollinator garden planning). To create a habitat that both draws in pollinators and encourages them to stick around, you must provide your intended guests with what they need to survive and reproduce: food, water, and shelter. Flowers provide pollinators with the food they need to sustain themselves: nectar (a carbohydrate with necessary amino acids) and pollen (a protein). Unless you want your new flying friends to either starve or leave indefinitely to find food, you should make sure to have something flowering throughout the year. Take a look at the "bloom time" category on the plant list you just made. Are all of the months covered? In more temperate climates, you may be limited to months in spring, summer, and fall (the "growing seasons"). Either way, consistency is key. An overlap of blooming is great; a flowerless period is not. Maximize your pollinators' potential by planting in drifts. How are your flowering plants arranged? One in a corner of your property, maybe a few under a tree in front of your house, and one in a pot on the back porch? You'll increase pollination efficiency by installing groups of the same plant together. If a pollinator can visit the same type of flower over and over, it won’t have to relearn how to enter the flower and can transfer pollen to the same species instead of squandering it on unreceptive flowers. What colors are the flowers in your landscape? A "moon garden" (all white flowers) will be great if you're only into moths and maybe an occasional bat. If your goal is to attract a diverse group of pollinators, then go for the rainbow! Refer to this chart of "pollinator syndromes" (discussed in part one of this blog) for some general guidance regarding the flower colors that various pollinators are attracted to. On to plants... Specific plants evolved with specific pollinators, right? (just nod your head) So it makes sense for you to plant natives if you want to get native pollinators to come around. Remember what you learned in part 2 of this blog about native bees and their non-native counterparts? To refresh your memory, it takes 80 non-native bees to do the work that one native bee does per day. These guys stay busy! PLUS most of them are solitary nesters, so they won't sting you! If you want your landscape to be buzzing with activity, be sure to include a good number of native plants. For your reading enjoyment, here's a nowhere-near-complete list of which crops and flowers our native bees pollinate: flowers, crops, bees. While butterflies and moths may be after nectar to take care of their own energy needs, flowers simply will not cut it for their caterpillar offspring. 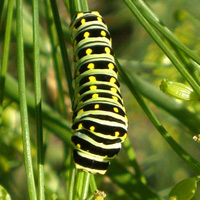 Most caterpillars need to feed on very specific plants in order to grow big and strong enough for metamorphosis. These are known as host plants. I hate to state the obvious, but just in case... You may have plenty of butterflies and moths fluttering and floating around your landscape, snacking on all of the nectar you've laid out for them, but when they are ready to lay eggs if you don't have the host plant(s) their caterpillars need, they will leave you faster than corn through a goose. For a short list of host plants and the butterflies they give rise to, please see the following link. needn't be enormous to be effective. A clean, reliable source of water is essential to pollinators. If you're lucky enough to have naturally running water (a pond, stream, etc) on your property, you've got this category covered... mostly. Just be sure that there's a shallow or sloping area for your pollinators to approach the water from without drowning. I'm a sucker for critters, but I won't be giving cpr to your beetles. 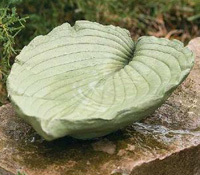 Human-made water features (fountains, birdbaths, etc) can provide pollinators with the same drinking and bathing opportunities, so don't fret. Keep the water fresh, do not add chlorine to it (sorry, you're probably sensible enough to know that, but I'd prefer to err on the side of caution) and you're good to go. Pollinators need protection from severe weather and predation and a place to nest and roost - just like you and I do (although they can deal without having a garage). Remember that list you meticulously compiled of all of the plants in your landscape? You thought you could get away with just reading it and not actually making it, didn't you? Tisk, tisk. Those of you who actually made the list should look at the height column now. Have you incorporated different canopy layers by planting trees, shrubs, and different-sized perennial plants? If not, try to mix it up a bit - this alone will help out your pollinators with their housing needs. 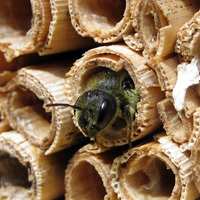 You already know that, as discussed in part 2 of this blog, the majority of our native bees build their nests underground. Some areas of uncovered soil will make it easier for them to access and build their tunnels. If you don't have existing snags for your new stem and tree-nesting pals to move into, you may want to make a simple bee box for them. Take one end off of a coffee can, fill it with open-ended sections of bamboo, and you'll have created a 4-star pollinator hotel. Your plants are in, your water feature is bubbling, your bee box has a few less vacancies, and your host plants are being snacked on. Maintenance is something we should quickly run through before wrapping up this blog. DO NOT be fooled into buying one of those ridiculous "butterfly houses" with the little slits in it. A fur coat in Miami will get used more often. DO NOT be meticulous. Your goal here is not to re-create a mini version of Versailles. Allow for a little messiness - for the pollinators' sake and your own. Take the time you would have spent on landscape cleanup and invest it in quiet observation. Consider keeping a log of garden visitors, noting which pollinators came when, and what they were attracted to. Simple notes like "yellow butterfly on blue lobelia in summer" are totally fine. When/if you want more details, check out the field guides at your local library; consider purchasing the one that seems most useful. DO NOT pick up all of the goodies that have dropped off of your fruit trees. Fermenting fallen fruits provide food for bees, beetles and butterflies. DO NOT pull every weed you see. I know - I'll really have to twist your arm to comply with that. Truth be known, there are a handful of plants that many people call "weeds" that are a good source of food for your pollinators as well. Learn what to leave alone. DO NOT go overboard raking up leaf litter. It's an ideal place for beetles to pupate, plus, hey - free mulch! DO NOT use pesticides. If you have an insect problem, explore controlling it with Integrated Pest Management (IPM) rather than busting out the Ortho or Bayer products. Chemicals have a way of killing more than you bargain for. That's about it. I hope that you've learned something new over the last few posts. If you take away only one thing from this blog, let it be this: as you while away your time in the upcoming months, spending weekends at the beach or springs and barbecuing with friends and family, remember that the towel you'll dry off with, the beer you'll drink, the watermelon seeds you'll spit, the hamburgers you'll eat (and the ketchup, mustard, or pickles you'll put on them), and the checkered cotton blanket you'll sit on until dark, when the fireflies (beetles) begin mating... none of these would exist without pollinators. These three posts have been great as is the list for plants for pollinators. Thanks, Lorraine. I'm just glad the content isn't falling on deaf ears (or eyes in this case)! Great three course meal. I've been entertained and informed, a nice combination. The flower you have shown in the garden are just amazing. I like the purple flowers the most!